Akhatova, F., Fakhrullina, G., Gayazova, E. and Fakhrullin, R. (2017). Nematode Epicuticle Visualisation by PeakForce Tapping Atomic Force Microscopy. Bio-protocol 7(21): e2596. DOI: 10.21769/BioProtoc.2596. The free-living soil nematode Caenorhabditis elegans has become an iconic experimental model animal in biology. This transparent animal can be easily imaged using optical microscopy to visualise its organs, tissues, single cells and subcellular events. The epicuticle of C. elegans nematodes has been studied at nanoscale using transmission and scanning (SEM) electron microscopies. As a result, imaging artefacts can appear due to embedding the worms into resins or coating the worms with a conductive gold layer. In addition, fixation and contrasting may also damage the cuticle. Conventional tapping mode atomic force microscopy (AFM) can be applied to image the cuticle of the dried nematodes in air, however this approach also suffers from imaging defects. Ideally, the nematodes should be imaged under conditions resembling their natural environment. Recently, we reported the use of PeakForce Tapping AFM mode for the successful visualisation and numerical characterisation of C. elegans nematode cuticle both in air and in liquid (Fakhrullina et al., 2017). We imaged the principal nematode surface structures and characterised mechanical properties of the cuticle. This protocol provides the detailed description of AFM imaging of liquid-immersed C. elegans nematodes using PeakForce Tapping atomic force microscopy. Nematodes, both free-living and parasitic, have been extensively studied due to their remarkable biology and effects on agriculture and human well-being. Apparently, the most studied and famous species among nematodes is a free-living soil nematode Caenorhabditis elegans (Sterken et al., 2015). This round worm has been successfully employed as a versatile model organism in a number of investigations (Fire et al., 1998; Kenyon, 2010; Swierczek et al., 2011; O’Reilly et al., 2014; Stroustrup et al., 2016), securing eventually a Nobel prize for Sidney Brenner, John Sulston and Robert Horvitz in 2002. C. elegans nematode is a tiny (~1 mm long) transparent animal which can be easily visualised using an optical microscope. Its cuticle, though thin and transparent, serves as a principal protective barrier between the worm and its habitat. Cuticle is an important marker of disease, when pathogenic bacteria colonize it, leading to the death of the infected animal. In addition, the structure of the cuticle may indicate the ageing in the nematodes. From the human health care and industrial point of view, monitoring of the cuticle of nematodes might be helpful in elucidation of novel antinematode chemicals affecting the cuticle. As a result, nanoscale imaging of the nematode epicuticle in its natural liquid environments may open new avenues in biomedical research. Previously, the cuticle of nematodes (mostly employing C. elegans as a model organism) has been studied using electron microscopy, both transmission and scanning. Unfortunately, electron microscopy does not allow imaging the worms in liquid, which is their native environment. Sample preparation for electron microscopy requires fixation, dehydration, contrast staining or surface sputtering, and also resin embedding for ultrathin slicing. As a result, nematode cuticle may exhibit secondary artifacts preventing from evaluation of native surface structure and mechanical characterisation. Atomic force microscopy has been established as a potent tool in imaging biological samples in situ, including imaging live cells in liquid media (Beaussart et al., 2015). Recently, the application of tapping mode AFM to visualise C. elegans nematodes in air has been reported (Allen et al., 2015). Imaging in air suffered from the same drawback as scanning electron microscopy, for example the images demonstrated the typical shrunk and collapsed cuticle surfaces apparently caused by dehydration and air imaging. We envisaged a different technique, based on PeakForce Tapping AFM mode (Alsteens et al., 2012) for successful visualisation of C. elegans nematode cuticle in water (Fakhrullina et al., 2017). Here we report a detailed protocol for this technique. Note: All chemicals were purchased from Sigma-Aldrich unless noted otherwise. Note: Do not use air scanners for scanning in liquid, this may damage the instrument. Note: Other AFM probes from Bruker or other producers approved for using in PeakForce Tapping mode having characteristics similar to ScanAsyst-Fluid probes can also be used. Prepare 5 mg ml-1 aqueous solutions of PAH and PSS polymers (5 ml each). Drop 50 µl of PAH solution onto the central part of a dust-free glass slide, incubate for 20 min in a humidified chamber (any tightly closed glass or plastic container with moist cotton pad might be used to prevent the premature evaporation), wash several times with water. Repeat the same using PSS solution. Repeat steps A2 and A3 until the resulting coating architecture is (PAH/PSS)12PAH (12 consecutive PAH/PSS bilayers followed by a final PAH layer). The outmost polyelectrolyte should be PAH to ensure the positive charge of the deposited film. More information on fabrication of LbL films can be found elsewhere (Lvov et al., 1995). Cultivate wild type C. elegans (N2 Bristol) nematodes on NGM-supplemented agar plates at 20 °C using a thermostated shaker according to a standard protocol (Brenner, 1974). Use Escherichia coli OP50 bacteria to feed worms. Observe the animals using a stereomicroscope after 48 h to detect gravid nematodes. Wash off gravid adult hermaphrodites with M9 buffer (see Recipes) into a tube and harvest by centrifugation for 2 min (1,100 x g, applicable to eggs, larvae and adult hermaphrodites). Dissolve the animals using aqueous 2% NaOCl/0.45 M NaOH solution (4.5 ml) to obtain nematode eggs. Wash the eggs with M9 buffer several times, then collect by centrifugation as described above and place onto the sterile NGM agar plates. Cultivate the nematodes at 20 °C to obtain synchronised adult hermaphrodites. Alternatively, cultivate the worms for shorter time to obtain larvae animals (Brenner, 1974). Collect the nematodes as described in step B2. Euthanise the collected worms with 45 mM aqueous levamisole hydrochloride. Wash consequently with water. Fixate the animals using 2 ml of buffered glutaraldehyde (in M9 buffer) for 2 h at 25 °C, then wash with water. AFM should be initiated before the sample is ready for imaging (see below). Ideally, these steps should be performed at the same time. Switch on the microscope and the operating software. Install and calibrate the mechanical properties of the probe (ScanAsyst-Fluid) according to the manufacturer’s manual. Start calibrating in air, then repeat in water. Place a droplet (100 µl) of water-suspended fixated nematodes onto the LbL-coated glass slides. Wait 30 min for settling and attaching the animals to the LbL polyelectrolyte film. Remove the excess water from the glass surface by pipetting, then wash the slide with water 3 times to remove any loosely immobilised worms. Add 200 µl of water on the top of the LbL-deposited film retaining the worms. The adhesion of the animals to the glass slide can be checked using a stereomicroscope prior to AFM imaging. Secure the glass slide on the microscope stage using vacuum suction. This should be done with due care to avoid removing the liquid from the glass slide. Locate a worm using the internal AFM optical camera. The worms will appear on the computer screen connected to the AFM internal camera as they would be seen under a stereomicroscope (Figure 1). Figure 1. Immobilisation of nematodes on the support film. A sketch demonstrating immobilisation of an adult C. elegans nematode on (PAH/PSS)12PAH LbL-deposited film and subsequent AFM imaging in liquid (A). Optical microscopy camera snapshot demonstrating the approach of the AFM probe to head (B), body (C) and tail (D) region of an immobilised C. elegans adult hermaphrodite. Position the probe above a certain area of the worm (i.e., head, tail or body regions). Approach the tip to the surface. Use relatively low scanning resolution (i.e., 64 lines) for locating the cuticle surface. After locating the region of interest (ROI), reduce the scanning frequency (0.8-0.9 Hz) and peak force setpoint (1 nN); increase the scanning resolution (up to 512 lines). The typical AFM images of an adult C. elegans nematode are shown in Figure 2. Figure 2. PeakForce Tapping AFM images of an adult C. elegans nematode inmmobilised on (PAH/PSS)12PAH LbL-deposited film: tail region (upper row) and body region (lower row). A and D. Height sensor topography images; B and E. Peak force error images; C and F. 3-D rendering of height sensor data with peak force error data overlayed. Collect images in the following channels: height sensor, peak force error, adhesion and Sneddon modulus mode. Figure 3 demonstrates the images obtained in all four channels. Figure 3. PeakForce Tapping AFM images of L1 larvae (A) and adult C. elegans (B) nematode imaged in water in topography (height sensor), peak force error, adhesion and modulus (Sneddon model) channels. Scale bars = 1 µm. Scans can be obtained using higher aspect ratios (i.e., 5-6), which allows increasing the longitude of the images (compare aspect ratios in Figures 2 and 3). For statistically-significant quantitative evaluation examine 5-10 individual randomly selected nematodes. Export raw data files to NanoScope Analysis software. Open a file, then flatten the image using 3d flattening order. Adjust colour scale using ‘Color Bar Scale Relative to Minimum Data Cursor’ function. Export high-resolution tiff files using Journal Quality Export function. For advanced image processing and nanomechanical characterisation refer to the NanoScope Analysis software operation manual. This study was performed according to the Russian Government Program of Competitive Growth of Kazan Federal University. The authors acknowledge the RFBR 17-04-02182А grant. This protocol was adapted from our previous publication (Fakhrullina et al., 2017). We thank Ms. E. Dubkova for technical help. The authors have no conflicts of interest. Allen, M. J., Kanteti, R., Riehm, J. J., El-Hashani, E. and Salgia, R. (2015). 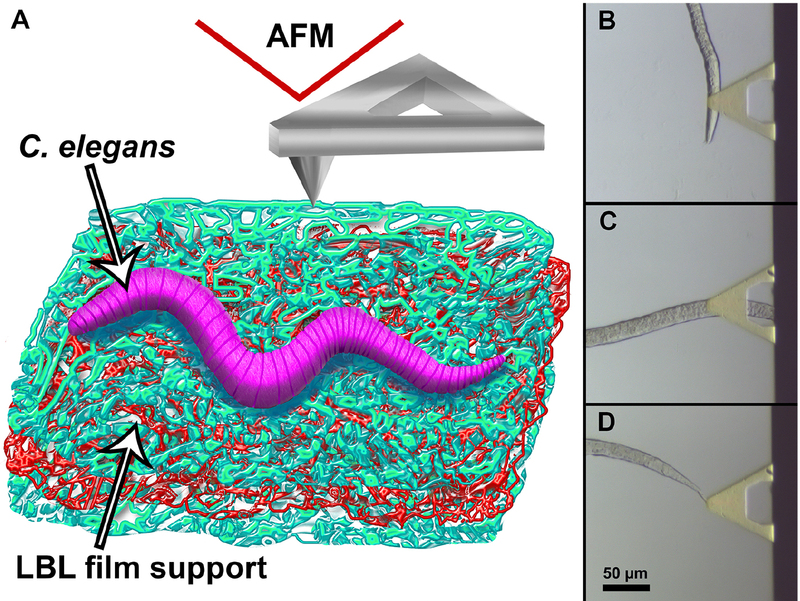 Whole-animal mounts of Caenorhabditis elegans for 3D imaging using atomic force microscopy. Nanomedicine 11(8): 1971-1974. Alsteens, D., Dupres, V., Yunus, S., Latge, J. P., Heinisch, J. J. and Dufrene, Y. F. (2012). High-resolution imaging of chemical and biological sites on living cells using peak force tapping atomic force microscopy. Langmuir 28(49): 16738-16744. Beaussart, A., El-Kirat-Chatel, S., Fontaine, T., Latge, J. P. and Dufrene, Y. F. (2015). Nanoscale biophysical properties of the cell surface galactosaminogalactan from the fungal pathogen Aspergillus fumigatus. Nanoscale 7(36): 14996-15004. Durkovic, J., Kardosova, M. and Lagana, R. (2014). Imaging and measurement of nanomechanical properties within primary xyleme cell walls of broadleaves. Bio Protoc 4 (24) e1360. Fakhrullina, G., Akhatova, F., Kibardina, M., Fokin, D. and Fakhrullin, R. (2017). Nanoscale imaging and characterisation of Caenorhabditis elegans epicuticle using atomic force microscopy. 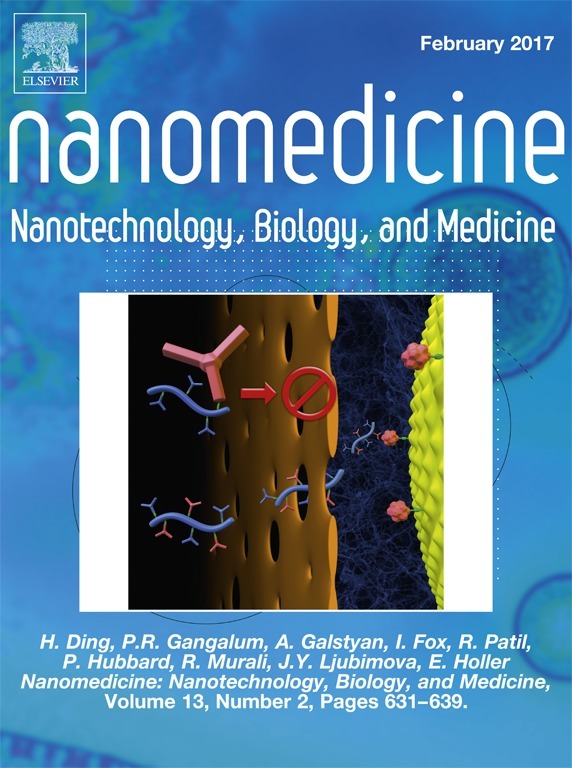 Nanomedicine 13(2): 483-491. Fire, A., Xu, S., Montgomery, M. K., Kostas, S. A., Driver, S. E. and Mello, C. C. (1998). Potent and specific genetic interference by double-stranded RNA in Caenorhabditis elegans. Nature 391(6669): 806-811. Kenyon, C. J. (2010). The genetics of ageing. Nature 464(7288): 504-512. Lvov, Y., Ariga, K., Ichinose, I. and Kunitake, T. (1995). Assembly of multicomponent protein films by means of electrostatic layer-by-layer adsorption. J Am Chem Soc 117(22): 6117-6123. O’Reilly, L. P., Luke, C. J., Perlmutter, D. H., Silverman, G. A. and Pak, S. C. (2014). C. elegans in high-throughput drug discovery. Adv Drug Deliv Rev 69-70: 247-253. Sterken, M. G., Snoek, L. B., Kammenga, J. E. and Andersen, E. C. (2015). The laboratory domestication of Caenorhabditis elegans. Trends Genet 31(5): 224-231. Stroustrup, N., Anthony, W. E., Nash, Z. M., Gowda, V., Gomez, A., Lopez-Moyado, I. F., Apfeld, J. and Fontana, W. (2016). The temporal scaling of Caenorhabditis elegans ageing. Nature 530(7588): 103-107. Swierczek, N. A., Giles, A. C., Rankin, C. H. and Kerr, R. A. (2011). High-throughput behavioral analysis in C. elegans. Nat Methods 8(7): 592-598. How to cite: Akhatova, F., Fakhrullina, G., Gayazova, E. and Fakhrullin, R. (2017). Nematode Epicuticle Visualisation by PeakForce Tapping Atomic Force Microscopy. Bio-protocol 7(21): e2596. DOI: 10.21769/BioProtoc.2596.